This is the recollection of our first ever trip to Kampung Parang; when we were still in The Backyard Tour Guide project. 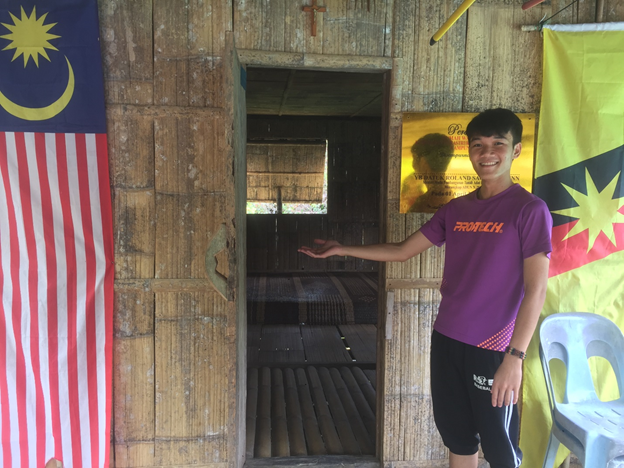 The experience to Kampung Parang for the Backyard Tour Guide team actually began at late evening, after arranging with our youth guide Harry and Gloria to bring us there. The trip to Kampung Parang was an exciting one, we were unfortunate to run into heavy rains that resulted in poor visibility, yet despite all that, we were able to weather the storm through the hilly tarmac roads. It was a bit of a roller-coaster ride but the thought of seeing the village for the first time just made us forget about all that. Upon arrival it was already nightfall so we made our way to the Harry’s house where we were warmly greeted by the whole family and treated to dinner. After dinner we went to the village chief’s house where we would spend the night in. The chief greeted us warmly as well and we had a fruitful discussion with him on how we planned to carry out our program in the village. After that, we rested, waiting for the sunlight of a new day. The next morning, our youth guides; Harry and Gloria, along with the village chief, brought us on an adventure to tour all the waterfalls in the village. The trip to each of the waterfall varied from each other; one took only a 5 minute walk while one could be half an hour away. After the fun journey of waterfall-discovery, our youths suggested we join them in the village’s favorite hangout waterfall, which is actually within the village itself. It did not take us a long while to say yes; perhaps 5 seconds? We did not regret. The soothing feeling of water rushing down from head to toe while reclining on the rocks was just too good to be described in words, it was an experience that you’ll have to go for it, to believe. We made our way back to our home base in Kampung Git at evening that day. Looking back, it was a fruitful journey as we now have inside knowledge on the place and couldn’t wait to come up with a package with the youths to get more people to experience the serenity of nature and soothing waters as we did. We would definitely come back for more. Interested to visit this place? Find out more about this village, Kampung Parang here.